Good reference for DNA structure and inheritance. Try the fly gene interactive. Good quiz material. Spectropherograms from class were found to be linked to one of the most widely recognized genetic mutations the BRAC gene mutation. Article in Discovery highlights its 2,000 year origin in the Middle East. Random AssortmentImportant aspect of meiosis is the introduction of variation. 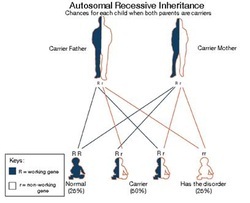 Random assortment is critical in introducing variety- this is part of why siblings are similar but not identical to each other. Variations can lead to potential trait being selected for in natural selection which is an advantage over the clonal copies that are made from binary fission.